Welcome to my DietBet Workout Program. This is a 30 Day Program to help you achieve your goal of losing 4% of your body weight during the month. Weigh in starts on Sept 1-2, the game officially starts September 3rd, but you can join up to 2 weeks into the game. I will be updating this list daily with links to each workout for the month so you will have an easy reference point to access each workout. 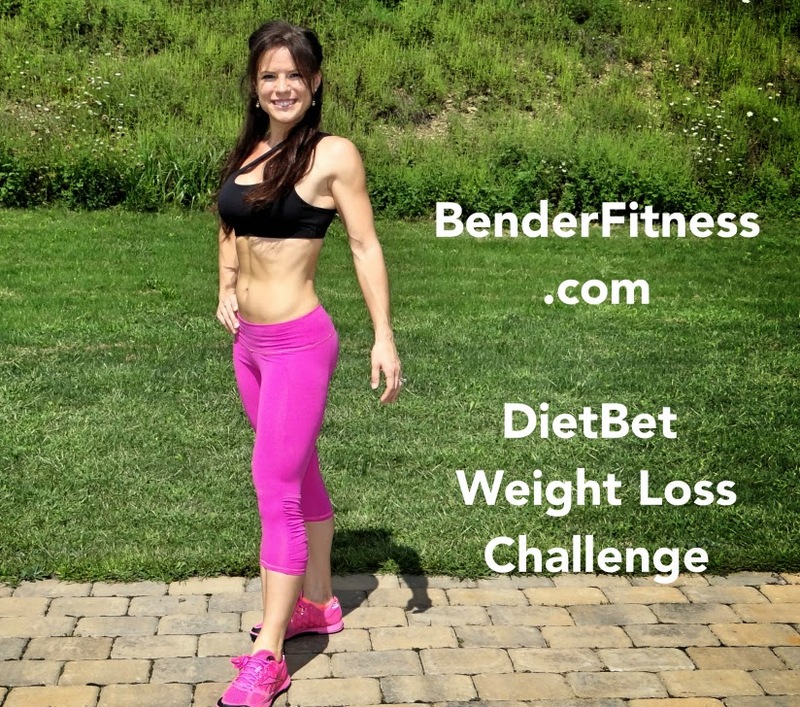 If you haven’t signed up for my DietBet you can do so here: www.dietbet.com/BenderFitness. For those of you joining the DietBet I am also including four brand new specialized workouts throughout the month. You will receive special access to one new workout per week to use in addition to the program listed below. Check in on Facebook, Instagram or Twitter throughout the month to let me know how you’re doing with your goal! You can share your progress pictures/results or keep them private, but it’s a great way to keep track of your success during the month. The Links will be activated daily throughout the month so you can easily find each workout for the challenge. Bookmark this page for easy access! Hey, Melissa. I’m in! The DietBet that is. Challenge accepted! 🙂 Starting day 1 right now!!! Thank you for inspiring me. Your workouts are so helpful! I am interested in doing a bikini competition in March. I saw that you have a 12 week program for that. I did Day 1 today, but then I saw this 30 day challenge. Since I’m still far out from March, do you think I should start with this? If so, since you are already into week 2, what day should I start with tomorrow? Day 1 or Day 12? I just finished my 4th diet bet. I have won $205 and lost 12 pounds in 2 months! I’m starting a new diet bet on 5/1/15. If you want to join me, the link is below. It varies by person. A good place to start is by eating as you normally do and logging/tracking all of your food. That will give you a baseline of what you are consuming and you can adjust that to suit your goals. It gets tricky because often people aren’t consuming enough (1200 or less is typically not enough-especially if you are working out) and they fear increasing calories, but it often helps them achieve their goal. Also, the number of calories depends on your goal: weight loss, building lean muscle, maintaining weight, etc. I hope that helps a bit! I wish there was a more specific answer! I would love to be a part of your new diet bet challenge! I am starting school next week (going back for my masters) and also working full time, so I know it’ll be tempting to ignore excercise and proper butrition w/ all the busyness. I’ve also been trying to lose these last 5 pounds, which is 4% of my current body weight and feel like this will be the perfect motivation! Thanks for doing this! I cant wait to start! These workout’s are kicking my a** so far! Love how strong and motivated you are. I am so grateful that you made these great workouts available to everyone free of charge. I had a question concerning the cardio part of the challenge. Should we be doing 30 minutes of cardio everyday of the challenge. If so, what kind of cardio do you recommend? Walking, HITT or high intensity? If you are able to do the cardio every day that’s great. A good goal is to aim for 3-5X per week. It can be cardio of your choice: walking, HIIT, running, jump rope, swimming. The main thing is to listen to your body, and focus on increasing your overall activity/movement throughout the day. Hi Melissa, I wanted to start this challenge and I was wondering if this challenge includes cardio or if we should do cardio separate to these workouts (if it is mainly just muscle building), thanks! You can add 30-minutes of cardio to any workout (but you will still get a great burn doing the workouts on their own!) When I add cardio, I aim to keep total workout time to 60 minutes or less. I hope that helps! I am on day 26 of this DietBet challenge, and although I only do a half-assed workout (I’m allergic to too much hard work…) and don’t pair it with any additional cardio (I have a 7-month old baby, so time pressured), I can’t believe the changes I can see in my body already! I’d already lost most of the baby weight, but my body just didn’t look anything like it used to, but things are back to where they should be now, so I wanted to say a big thank you. I’ve gotten on and fallen off the exercise band wagon so many times over the years (I had most success with fitnessblender until now) but this is the longest I’ve lasted, hands down, so I wish to heap praise on you and thank you so much for how many varied and free workouts you provide. Anna, Thank you so much to take the time to leave such a wonderful comment. Congratulations on your baby. I am so happy that you are seeing changes, and feeling great!